Today TECHknitting has a Christmas present for you--a maybe new use for an electrical appliance you probably already own: your steam iron. The bulk of this post is about the uses of a steam iron in improving your knitting, and particularly in making hems and bands behave. But before we plunge into all that, I thought to take a brief look at the iron itself. Steam is vapor from boiled water. In order to make steam, your iron boils water inside a little chamber. Water generally contains minerals. Sometimes, the mineral load of the water will cause problems. If you always use the same pot or kettle to boil water, you already know whether your particular water has troublesome amounts of minerals by the presence or absence of mineral deposits. If your kettle stays clean regardless of how much water you boil in it, you have no worries. But if your kettle is mineral-encrusted, then so will the inside of your iron be. Therefore, if you have an new steam iron, keep it new by topping it up only with distilled water--a gallon from the supermarket will last a LONG time in most households. If you are reading this post at 2 A.M. and are struck with a sudden yen to start steam ironing, boiled COOLED water is a near substitute. Boil the water, let it cool in the pot, and pour the cooled water off, leaving the minerals behind. DO NOT USE BOILING WATER--first of all, you will hurt yourself, second, you might wreck the plastic parts of the iron, and third, the water does not shed the minerals until it cools. Another problem with irons is gooky sticky stuff melted onto their sole plates. This arises from ironing synthetics on a high setting: they melt. There are various commercial remedies, and these work well. 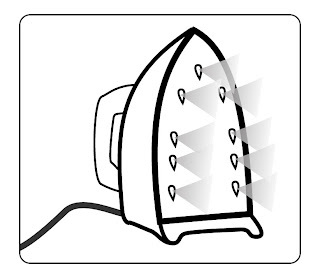 The old fashioned remedy, as practiced by my grandmother was this: after every round of ironing, grandma would stand the iron on a old rag, and rub an old candle end on the sole plate. (She used white paraffin "household candles" of course, not colored candles or tapers.) The melting wax dissolved any sticky, ironed-on gook, and she'd clean the excess by ironing it off onto the old rag. However, she did this in front of an open window (it smokes) with the iron unplugged, and on a distinctly low-tech iron--no teflon plate or anything like that. Also, the sole plate of her iron covered the bottom of the iron--there was no offset between the sole plate and the heel of the iron for the wax to drip off onto. Nowadays, you are probably better off with the commercial remedies. If you do resort to candle ends for spot cleaning in a particularly tough case, do it CAREFULLY--hot wax is a BURN hazard. It is also a FIRE hazard as are old waxy rags. And of course, with any remedy, home made or commercial, be sure to iron all the residue off onto rags before you would dream of letting that iron near your precious knits. Stockinette curls. If you want to know more about why, click here. The very worst, the very most annoying curl of all comes when a flat object (scarf, afghan) is edged with a non-curling fabric--an edging which is SUPPOSED to stop the problem. Up flip the edges, or down they curl, or maybe both. The one thing they don't do is lay flat. Almost as annoying is the curl and flip of sweater hems, bands and cuffs. Now, if you've been following along for the last several posts, you'll know that part of the secret of making non-curling knitwear is by improving your cuffs and bands. The big secret is moving the edge of the fabric away from the edge of the garment by doubling back your bands and cuffs, letting them roll, or hemming them, then knitting them shut or sewing them shut. However, most patterns today do not call for such bands and cuffs. Typically, a garment pattern will call for a band of a non-curling fabric to be knitted onto a stockinette fabric, garter stitch bands on a scarf, say. The chain of logic behind non-curling stitch bands is this: the garment designer notices, correctly, that stockinette stitch curls like mad, but that garter stitch (seed stitch, ribbing etc.) does not curl or flip. "Ah ha!" says the designer, "I will put a garter stitch band on this stockinette item I am designing, and then the stockinette fabric will be tamed, and the garment edge will not flip or curl." This is a logical conclusion, and, in fact, garment edge itself will not curl up. However, that does not mean that the GARMENT will not curl up. As disappointed knitters in knitting forums all over the internet can testify, the most likely result of a garter stitch band on a stockinette stitch garment is that the bands either flip up, or the whole garment continues to curl, taking the "non curling edge" right along with it. "How can I block the curl out of my scarf?" has to be one of the most frequently asked questions on every knitting forum out there, followed by "how can I get the front bands of my cardigan to lay flat?" Of course, the fact that the bands are curling and flipping has as much (or more) to do with the stockinette fabric to which the garter stitch bands have been attached, than with the bands themselves. However, most knitters think of curling and flipping bands as a band problem, so that's why this issue is included as part of a series on bands and cuffs. One last note before we plunge in: TODAY's post lays out a method for dealing with already existing curled edges, like the scarf or cardigan bands in the above example. The NEXT post will show how to knit edges which are less likely to want to curl in the first place. Although the idea of using these methods on one's hand knitting may seem beyond strange, chemicals, blocking and ironing are all actually very common knitwear treatments, albeit commercial knitwear. Think about it: don't you wonder why machine-made items of stockinette consent to lay flat, while hand knits want to curl so badly? The answer is partially because machine-made knits are generally knit from finer yarn than handknits, and so the thinner yarn from which they are made can exert less curling force. However, that is not the whole answer. In fact, machine-made knits have the same tendencies to curl as hand knits, but industrial processes overcome this tendency. In other words, machine-knit fabrics have chemicals applied to relax them, or have the bejabbers stretched out of them or steam ironed out of them, or all three. Hand knitters faced with a wildly curling scarf, or brazenly flipping cardigan bands will be able to persuade these ill-behaved hooligans to better manners with a page out of the commercial knitter's playbook. A good soaking spray with fabric relaxer is a good start. Fabric relaxer (or wrinkle remover) is a relatively benign substance sold under various trade names. Evidently the relaxer is essentially a wetter, which lets moisture into the fabric fibers, causing them to swell a bit, and de-kink. Once damped with fabric relaxer, the item can be further wetted with a spray bottle of water, or even a quick trip to the sink for a brief soak, and this treatment can be followed by some serious wet-blocking. When I say "serious," I mean blocking to the edge of the capacity of your blocking board to hold the fabric outstetched, and to the edge of the capacity of your blocking pins or wires to hold without deforming. Are you surprised by this advice? Many are. And yet, this sort of extreme blocking is not new. Hand production knitters of the past have traditionally employed extreme blocking. Those picturesque sweater forms in the old photos of the Shetland Islands had a very serious purpose, and couture knitting today also employs these techniques. Of course, extreme blocking like this is going to make the fabric grow. Commercial knitwear factors this in, but unless you first blocked and stretched your swatch and then knit to the blocked dimensions, you probably have not--blocking and stretching swatches is not part of most hand-knitters' repertoire. For this reason, extreme blocking by hand knitters is best reserved for items where size is NOT important such as scarves and lap robes. This brings us to the main alternative. For items where fit IS important, the steam iron is the most mighty weapon against curling bands, or against a garment which is curling and taking the band. Each of these factors has the capacity to alter hand knit fabric, sometimes fatally, so the first rule of using the steam iron on your woollies is BE CAREFUL. Increase these factors one by one, each in tiny baby steps. In other words, DON'T start with high steam, high heat and lots of force when you come to improve your knitting with the steam iron. On wool and acrylic, the steam has as nearly as much effect as the pressing, so be sure that the STEAM setting on your iron is set on "high" right from the start. It may be that steam with hardly any pressure at all will do the trick. This is called steam blocking, and if it works, you lucky thing, then you need never actually iron at all. In other words, on acrylic and wool, the ideal is to start with a steaming, billowing iron held just above the fabric, and only if this does not work, would you next progress to light dabs, and only then to pressure. If your item is silk, bamboo, cotton--anything but acrylic or wool--do NOT start with billowing steam. Instead, start with the absolutely lowest steam AND the lowest heat AND the least pressure. Increase the steam in the same manner as you increase the heat and the pressure: in tiny increments. Heat is a powerful tool on fabrics. Most obviously, a too-high heat can burn your precious hand knits. Even at non-burning temperatures, Heat can "set" woolen fibers--kink them permanently. It can melt acrylics, and can change the very composition of these and other fibers. Therefore, be careful. If the garment is woolen, be careful of scorching--maybe use a pressing cloth or flour sack kitchen towel between the garment and the iron. If your item is acrylic (or another synthetic) use the cloth or towel PLUS be careful of melting--increase the heat by VERY slow degrees, and realize that non-wool, non-acrylic fibers are generally even less resistant to heat, so SLOW is the watchword for increasing the heat. All knitting three-dimensional, so ironing has the capability if flattening it. When ironing on stockinette garment with garter stitch bands, remember that the garter stitch itself has no tendency to flip. It is the stockinette which presents the problem. Luckily, the stockinette is far flatter than the garter stitch, and less likely to show the effects of ironing. Keep the iron on the stockinette part of the fabric, and the greater the pressure you are exerting, the more careful you must be of this. For wool and acrylic, start with a fully steaming iron. Progress in pressure and heat carefully. For other fabrics, start with the bare minimum of steam, and progress in steam pressure and heat carefully, increasing each in tiny baby steps. It MIGHT be that you have the stubbornest garment this side of China, and you MIGHT wind up pressing your stubborn garment with all your force at the highest heat. However, although this might be the place that you end, this is CERTAINLY NOT the place to start. Steam ironing is a big gun--it certainly has the power to persuade curling stockinette to mend its ways. However, as with all things, there is a trade-off. Although steam ironing will certainly help with curling bands, the price is a rather listless fabric. I knew a production hand- and machine-knitter who HEAVILY ironed all her garments--and she made many, many garments over the years that I knew her. All those many garments did her bidding. They lay flat, yessiree, no question: never a curl, never a flip, no misbehavior at all, and the bands got up to no tricks. However, all those garments were oddly limp, with none of the spring normally associated with knit garments. Therefore, although steam ironing unquestionably works (especially when combined with fabric relaxer) this isn't a method to use if you can avoid it. Better, more elegant, would be to knit the garment with a band which doesn't want to curl or flip in the first place (or at least--doesn't want to curl and flip as much), which is the topic of the next post.